If you were to peek inside the brain of someone who regularly smoked marijuana, you would find that it didn't look quite like the brain of someone who didn't smoke. First, you might notice that a critical part of the brain that helps us process emotions and make decisions appeared smaller than in the brains of the nonsmoker. But you would see something else, too: that the connections passing through that region of the brain were stronger and thicker. Thankfully, you don't have to go excavating brains anytime soon. A group of researchers has done the hard work for you. In a recent study, scientists used a combination of MRI-based brain scans to get one of the first comprehensive, three-dimensional pictures of the brains of adults who have smoked weed at least four times a week, often multiple times a day, for years. Compared with people who don't use, long-term, heavy marijuana smokers tend to have a smaller orbitofrontal cortex (OFC), a brain region critical for processing emotions and making decisions. But they also have more cross-brain connections that scientists think smokers may develop as a means of compensating for the difference in size. Unlike previous research, which has looked mainly at short-term smokers or simply at young or older users, this study is one of the first to look at pot's long-term effects on men and women between 20 and 40 years old who had smoked almost daily for between two and 30 years. The researchers looked at the brains of 110 people — 62 who didn't smoke and 48 who did — using three different types of MRI scans. In the smokers, these increased brain connections appeared to help them counteract the behavioral problems commonly associated with weed use, like trouble maintaining relationships or staying motivated enough to find or keep a job. 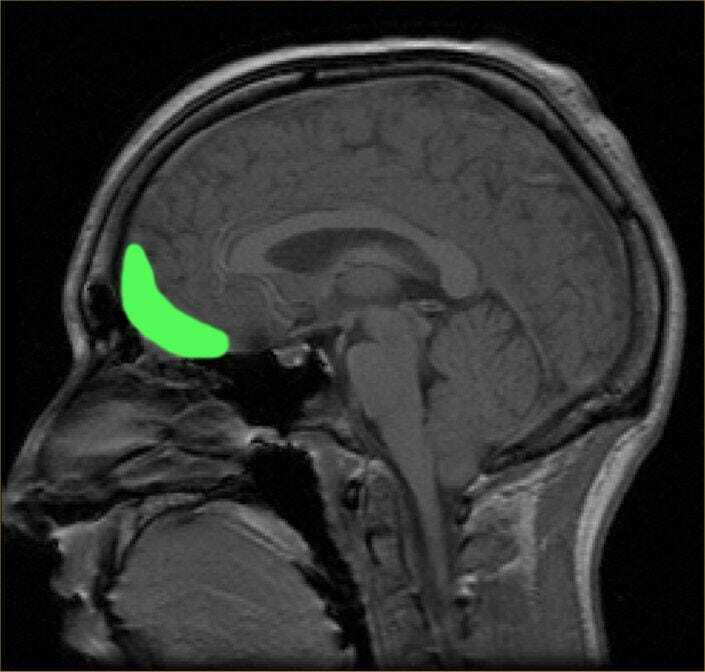 The approximate location of the orbitofrontal cortex, highlighted in green. But while new connections blossom throughout the brain during the first few years of regular use, they eventually recede. Researchers saw a significant drop-off in new brain links after about six years of regular use. So does smoking weed every day for a decade shrink your brain and make you dumber? Not quite. The regular smokers did have lower IQ scores overall when compared to the people who didn't smoke, but there's no way to know yet whether or how that might be linked to smaller orbitofrontal cortices or marijuana use in general. "We cannot honestly say that that is what's happening here," says Francesca Filbey, the lead study author and professor of neuropsychology at the Center for Brain Health at the University of Texas at Dallas. For starters, this study — the first ever to look at the long-term effects of weed smoking in heavy adult users across a wide age range— did not show that pot smoking caused certain regions of the brain to shrink. In fact, other studies suggest that having smaller orbitofrontal cortices in the first place could make someone more likely to start smoking. One recent study, for example, found that children as young as 12 who had smaller orbitofrontal cortices were significantly more likely to start smoking weed by the time they hit their 16th birthday. In other words, it could be that people with naturally smaller versions of this region may simply be more likely to smoke, and the weed might not be shrinking that section of the brain at all. There is also no clear evidence linking the brain differences the researchers found with any particular behaviors. In addition, all three things the researchers studied — drug-use habits, brain development, and IQ scores — are shaped by a variety of factors. Both the environment we grow up in and the specific combination of genes we inherit from our parents affect behavior and intelligence. The age when someone starts smoking pot can also be a key clue to how the brain will be different from a non-user's brain and how often someone smokes thereafter. Picking up the habit while young seems to be especially influential. "The earlier the use — especially during adolescence, when the brain is developing — the greater the effects," Filbey says. Of her study participants, those who started using the earliest had the most pronounced differences in brain development in terms of the size of the orbitofrontal cortex and the connections between parts of that region of the brain. Other studies in people have shown similar links between weed and smaller prefrontal cortex regions, but only research in animals has suggested that marijuana may kill brain cells or reduce their size. Scientists still don't know whether giving up weed can reverse its changes to the brain (if the noted differences are indeed caused by pot in the first place — still an open question) or whether the alterations are also present in recreational or short-term users. But as legal marijuana becomes a reality in the US, researchers are scrambling to find out.